St Mirren have appointed Alex Miller as assistant manager. Miller, Buddies boss in the 1980s, has also been in charge of Hibernian and Aberdeen and was director of scouting then first-team coach at Liverpool. Mark Spalding had been Ian Murray's assistant in Paisley but left the club by mutual consent on Monday. Murray's side are third bottom of the Scottish Championship and Scot Miller told St Mirren's website he was "looking forward to the challenge". 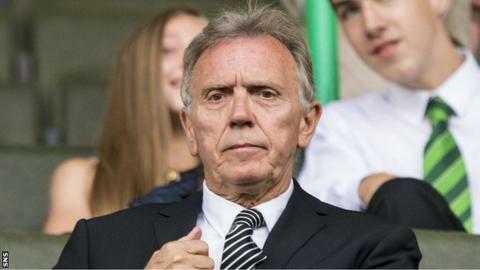 "I agreed to come and help St Mirren as they gave me my first opportunity to manage in the Premier League, also to assist Ian Murray who is a young manager making his way in the game," he explained. And Murray said: "I am very happy to have someone of Alex's knowledge and experience beside me and this will give myself and the squad a huge lift." During Miller's spell as Rafael Benitez's first-team coach at Anfield, Liverpool won the 2005 Champions League final and, three years later, the former Rangers defender moved to Japan to manage JEF United Chiba. Short spells in charge of AIK in Sweden and Russian side Sibir Novosibirsk followed. Miller will now assist Murray as he seeks to improve the Buddies' form this season. St Mirren have 10 points from their first 12 league games and are ahead of second-bottom Dumbarton only on goal difference. Hosts Falkirk beat Murray's men 3-0 on Saturday, with the visitors having Jack Baird and debutant Craig Reid sent off. However, the club have announced they will appeal against the dismissals. Announcing Spalding's departure, St Mirren said: "On reflection of Saturday's defeat at Falkirk it was felt that some changes were required going forward and after discussions it was agreed with Mark that he would step down from his role at the club in order for such changes to be made. "The club wish to thank Mark for putting the club and manager, Ian Murray first in this instance and for his hard work on and off the field during his time at the club and wish him well in the future."